Combine all ingredients except caramel in an oversized coffee mug. Whisk well with a fork until smooth. Microwave on high for 50 seconds. Cake should have started to turn solid form but still somewhat liquidy. 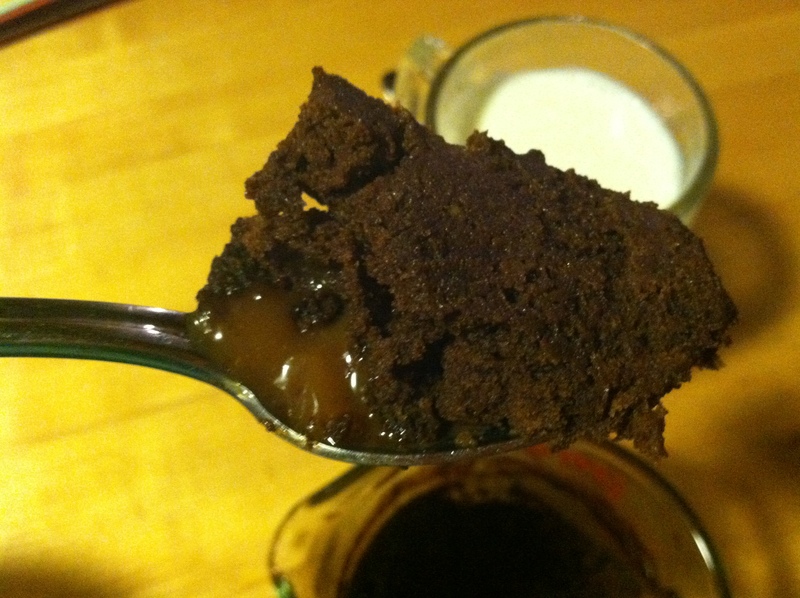 Remove cup from microwave and add in caramel to the center of the cake. Push it slightly down so that the chocolate batter covers the caramel, but you don’t want to push it too far down as the caramel will sink while cooking. Cook for an additional 40 seconds and check if batter is done. If it is is still gooey, cook for an additional 30 seconds. Mine was done at 1 min 45 seconds (total cook time including 50 seconds before adding caramel sauce). Cool for a few minutes before serving while still warm. The main issue I have with coffeecake is how delicious it is. It is pretty hard not to eat seconds or thirds. Lately we have been on a crumb coffeecake bender. I usually make my mom’s delicious sour cream coffee cake but this time I decided to venture out and try a new recipe she passed along. It is called a New York crumb cake and it is more crumbs than cake, my husband’s perfect ratio. Upon tasting it I was pretty stoked because it tastes just like Entenmann’s famous crumb cake, but instead of $6.99 it costs free ninety nine to make at home. 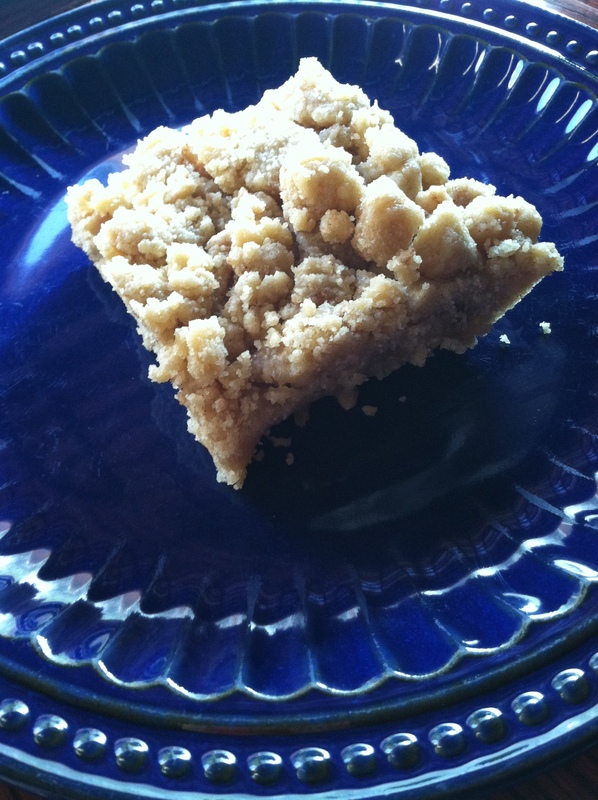 Crumb cakes are easy to make and so incredibly tasty. So if you like to make stuff from scratch that tastes like a knockoff of the real thing or even better, then make this recipe! Transfer baking pan to a wire rack to cool. Dust with confectioners’ sugar. Using a serrated knife or bench scraper, cut into 3-inch squares. Store in an airtight container for up to 3 days. Who’s coming to Sunday Dinner? I love trying new recipes, especially when I don’t plan to. I asked my hubby to pick up a pot roast at the grocery store, if you haven’t checked it out yet, try my amazing pot roast recipe I posted on here. I am very thankful when he does the grocery shopping for me so I don’t complain when he doesn’t get the exact item on my list. He brought home a beef bottom round roast so I typed that into google and viola, I found a Sunday roast beef dinner. I had always wanted to make a Sunday roast and never knew what cut of meat you needed to do that, I assumed it was some pricey sort of prime rib or something, but the bottom round roast was just as affordable as the pot roast I had put on the list. By the way, for pot roast you usually use a chuck roast. I was pretty sure the leaner and tougher bottom round roast would not turn into a tender pot roast, so I am glad I found the recipe below. My Sunday roast turned out amazing, as did my gravy, which I have never had success with before. The marinating before baking with the worcestershire sauce and also the rub really made the flavors sing. Also I made it with some homemade whipped mashed potatoes, the perfect accompaniment. So if you are planning a tasty Sunday dinner, check out my recipe and enjoy! Prepare the Roast: Adjust the rack to the bottom of the oven and heat to 425 degrees F. Blot any excess moisture from the roast, rub the Worcestershire sauce over the entire roast, and allow to marinate for 30 minutes, turning it twice. Reduce oven temperature to 325 degrees F and continue to roast until the meat’s internal temperature reaches 130 degrees F — about 2 hours. Let the roast stand for 20 minutes before slicing. Scrape the drippings from the bottom of the roasting pan, add the beef broth, and stir over medium heat until the mixture begins to simmer. While continuously whisking, add the flour paste and bring to a boil. Reduce heat to medium-low and let simmer for 4 to 5 minutes. If needed, add a little water to thin the gravy. Add remaining salt and pepper; serve warm. 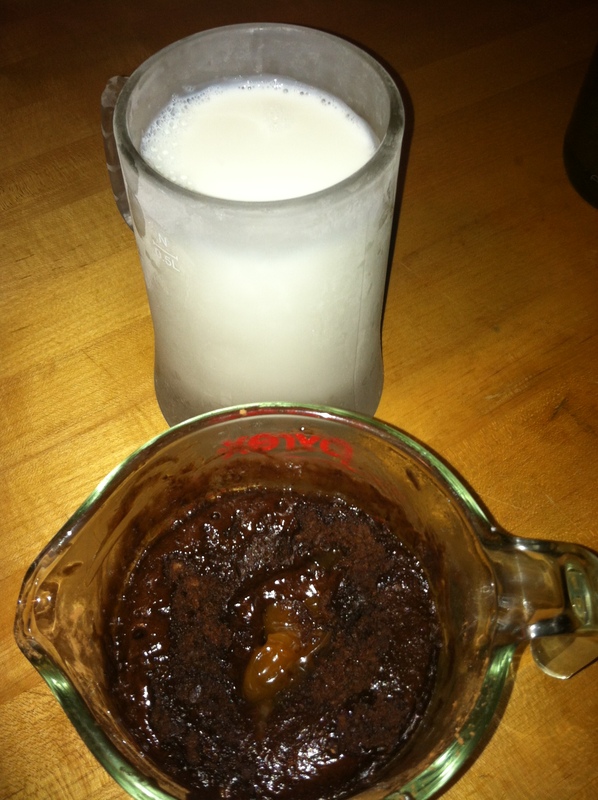 You are currently browsing the What Tara's Cookin' blog archives for June, 2013.